Penthouse 87B is a spacious four bedroom residence of 3128 square feet with ceilings up to 10'10", and spectacular Hudson River and Manhattan skyline views. The spacious corner great room measures over 670 square feet and features an adjacent windowed eat-in kitchen with custom oak wood cabinetry and Miele appliances. The master bedroom suite offers generous storage including two large walk-in closets and a luxurious windowed master bath. 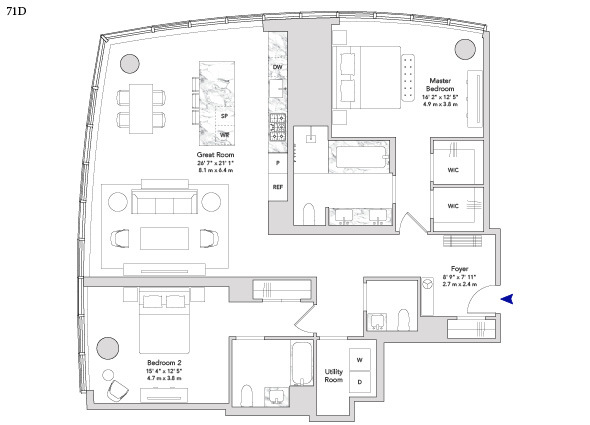 Bedrooms 2, 3 and 4 have en-suite baths and great closet space. An elegant entry foyer, utility room with side-by-side washer dryer, separate service entrance, and a powder room for guests make this a truly exceptional home. Panorama Residence 74B is a four bedroom residence of 3009 square feet with ceilings up to 10'10" and spectacular sunset views of the Hudson River. The corner great room features a windowed open kitchen with a unique free-standing marble island, custom oak wood cabinetry and Miele appliances. 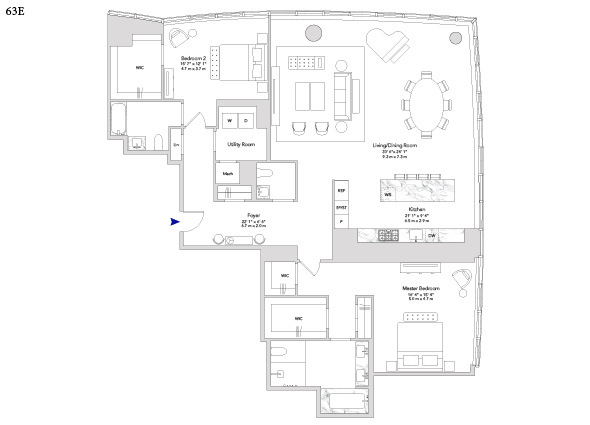 The master bedroom suite offers two large walk-in closets and a luxurious master bath. 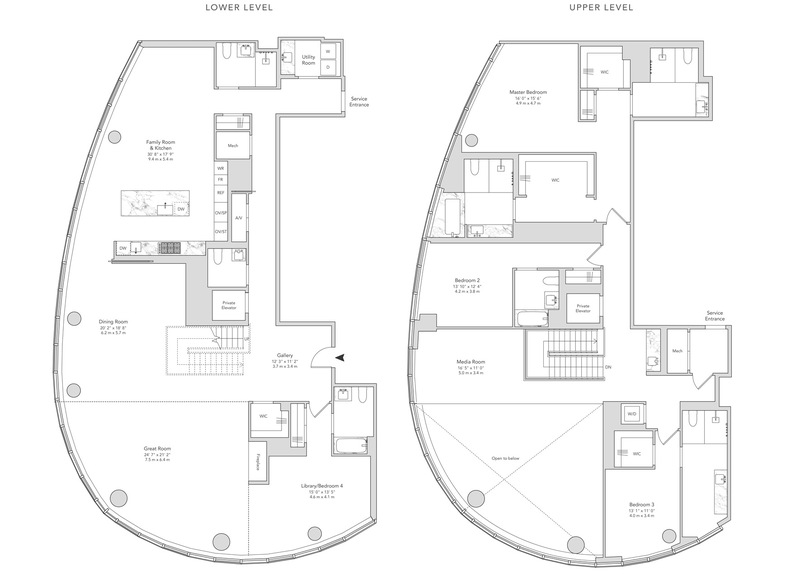 Bedrooms 2, 3 and 4 have en-suite baths and generous closet space. An elegant entry foyer, utility room with side-by-side washer dryer, separate service entrance, and a powder room for guests make this a truly stunning home. 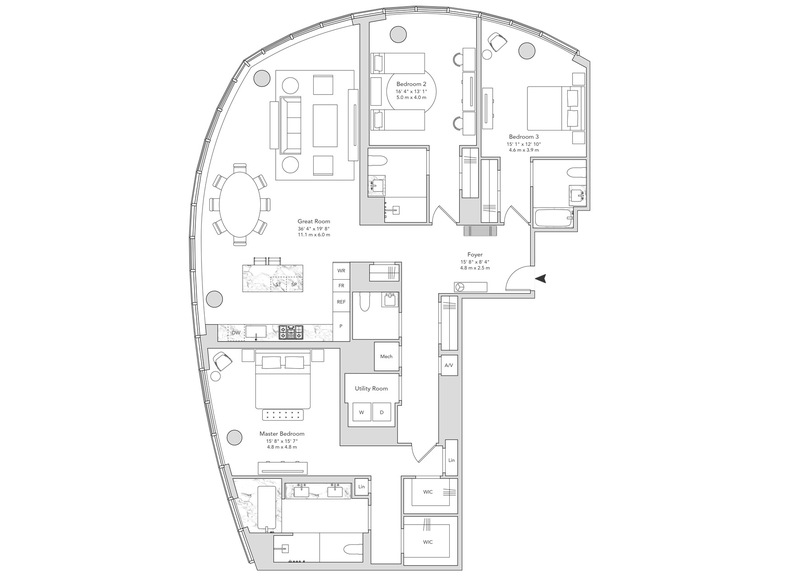 Panorama Residence 69A is an exceptional three bedroom residence of 2420 square feet with ceilings up to 10'10" and stunning skyline views. The corner great room features an open kitchen with a unique free-standing marble island, oak wood cabinetry and Miele appliances including steam oven and wine storage. 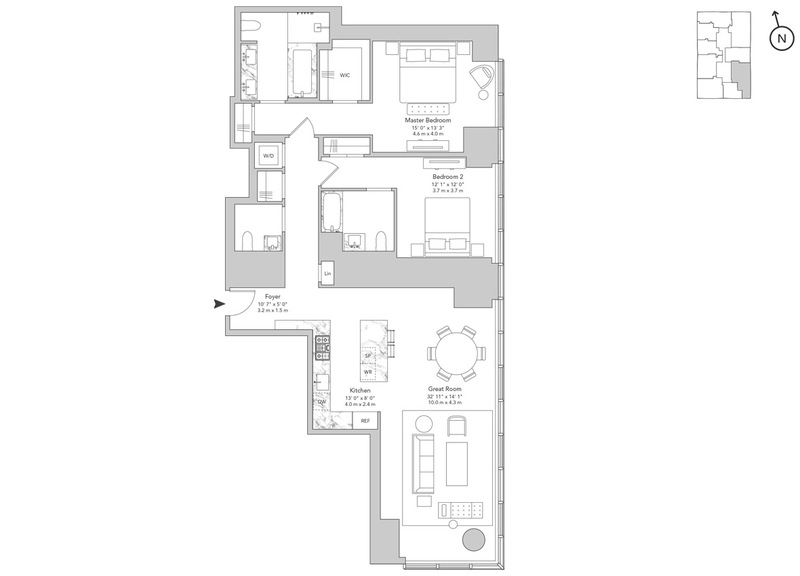 The master bedroom suite features two walk-in closets and a luxurious windowed master bath. A second and third bedroom with en-suite baths and walk-in closets, gracious entry foyer, side-by-side washer dryer, and a powder room for guests make this a truly exceptional home. 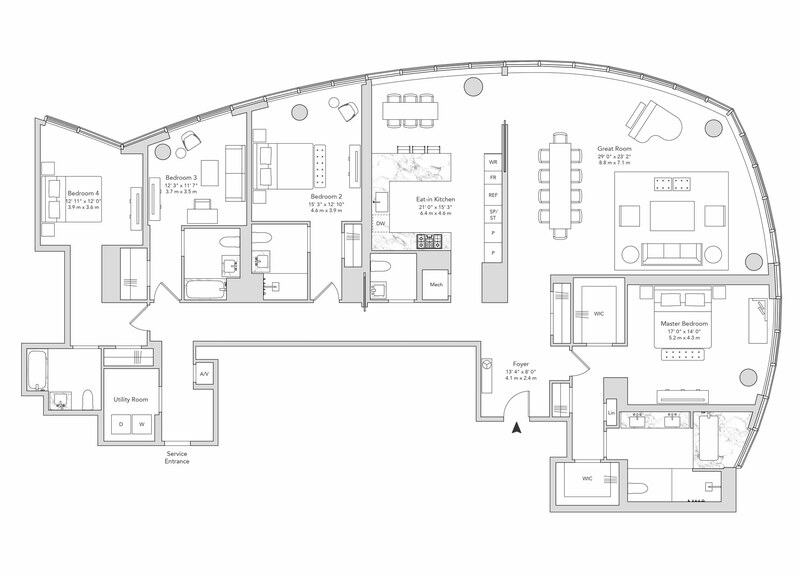 Penthouse 86C is a spacious three bedroom residence of 2566 square feet with ceilings up to 10'10"and spectacular Hudson River and Manhattan skyline views. The spacious corner great room measures over 750 square feet and features a windowed open kitchen with custom oak wood cabinetry and Miele appliances. 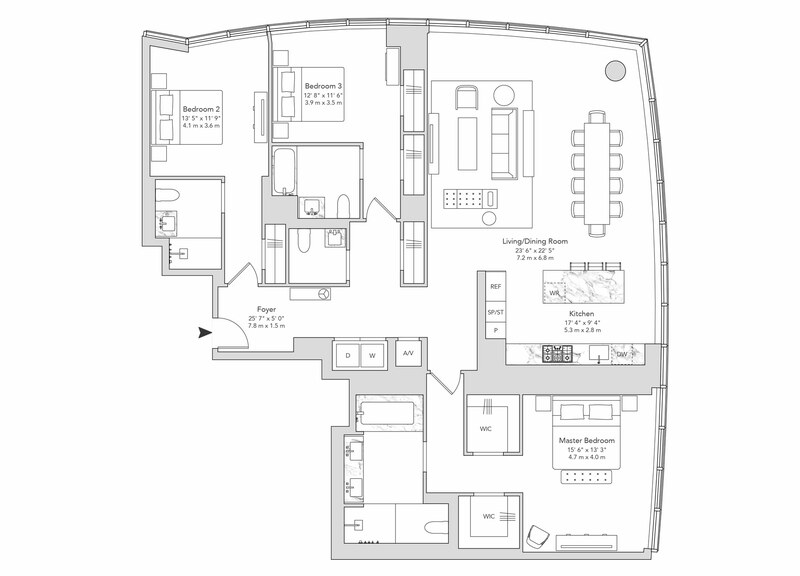 The master bedroom suite offers generous storage space including two large walk-in closets and a windowed master bath. Bedrooms 2 and 3 have en-suite baths and great closet space. An elegant entry foyer, utility room with side-by-side washer dryer, and a powder room for guests make this a truly exceptional home. Penthouse 84D is a truly stunning three bedroom residence of 2538 square feet with ceilings up to 10'10", and spectacular skyline views. The spacious corner great room measures over 530 square feet. An adjacent windowed eat-in kitchen features wood cabinetry and Miele appliances including a steam oven and wine storage. 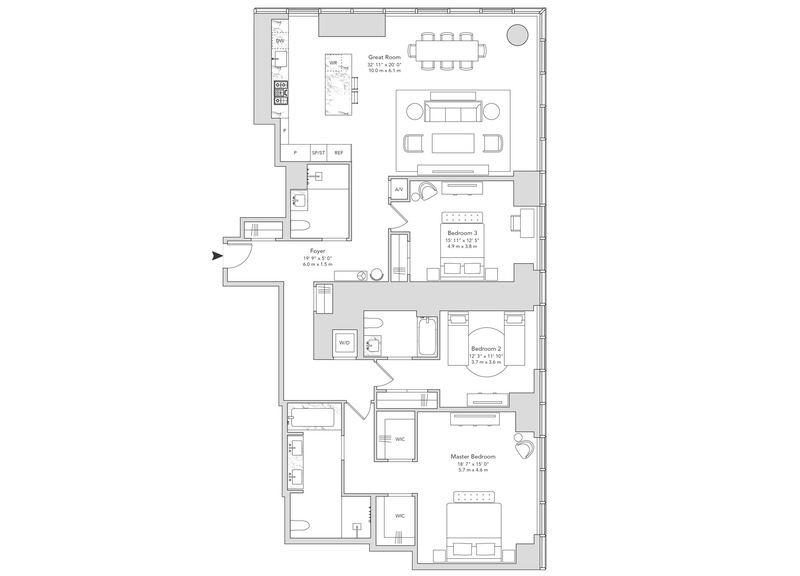 The master bedroom suite offers two large walk-in closets and a luxurious master bath. A second and third bedroom with en-suite baths, an elegant entry foyer, side-by-side washer dryer, and a powder room for guests make this a truly exceptional home. 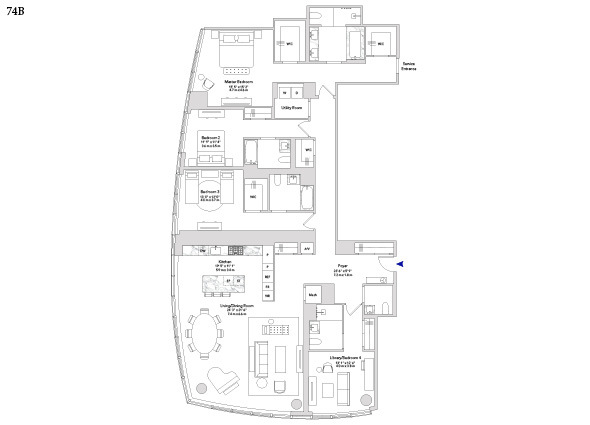 Panorama Residence 69E is a spacious three bedroom residence of 2304 square feet with ceilings up to 10'10" and spectacular views of the Manhattan skyline. The corner great room features a windowed open kitchen with a unique free-standing marble island, oak wood cabinetry and Miele appliances. 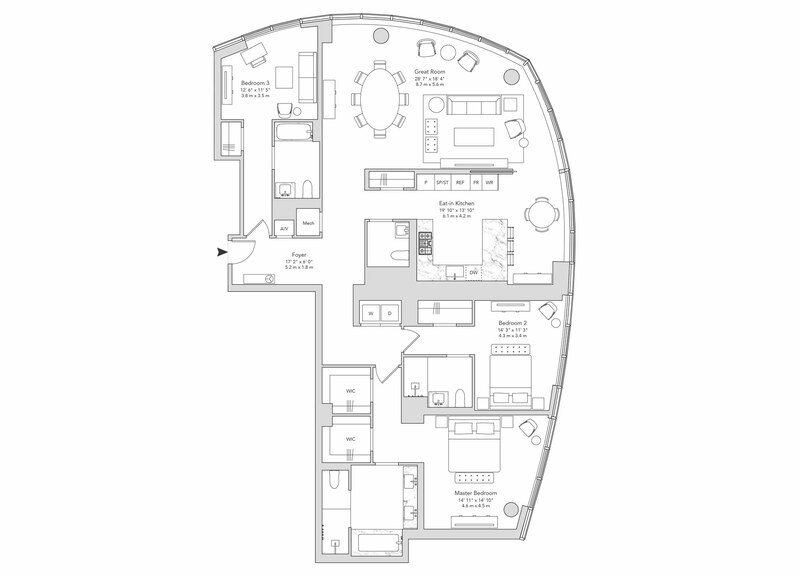 The master bedroom suite offers two large walk-in closets and a luxurious master bath. Bedrooms 2 and 3 have en-suite baths and generous closet space. An elegant entry foyer, side-by-side washer dryer, and a powder room for guests make this a truly amazing home. Loft Residence 63E is a spectacular two bedroom residence of 2517 square feet with ceilings up to 10'10" and stunning skyline views. The spacious corner great room measures over 730 square feet and features an open kitchen with a unique free-standing marble island, oak wood cabinetry and Miele appliances including a steam oven and wine storage. 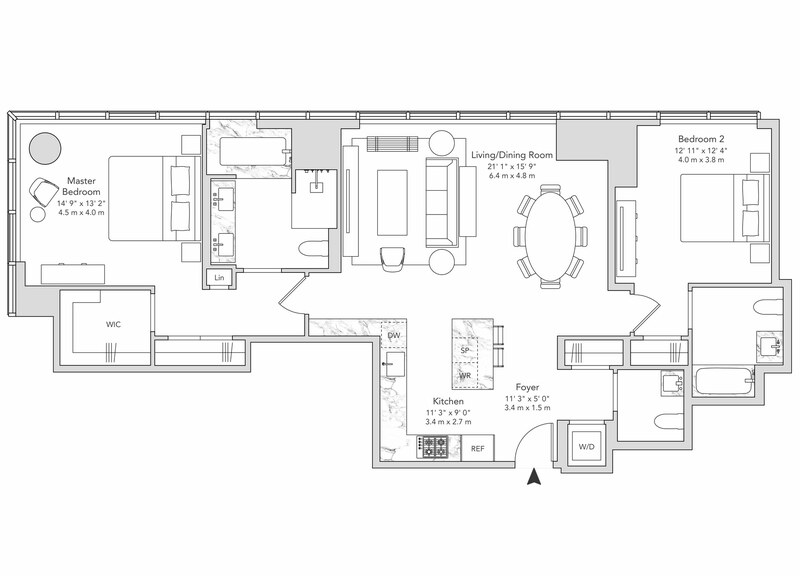 The master bedroom suite features two walk-in closets and a luxurious master bath. A second bedroom with en-suite bath and large walk-in closet, a gracious entry foyer, utility room with side-by-side washer dryer, and a powder room for guests make this a truly special home. 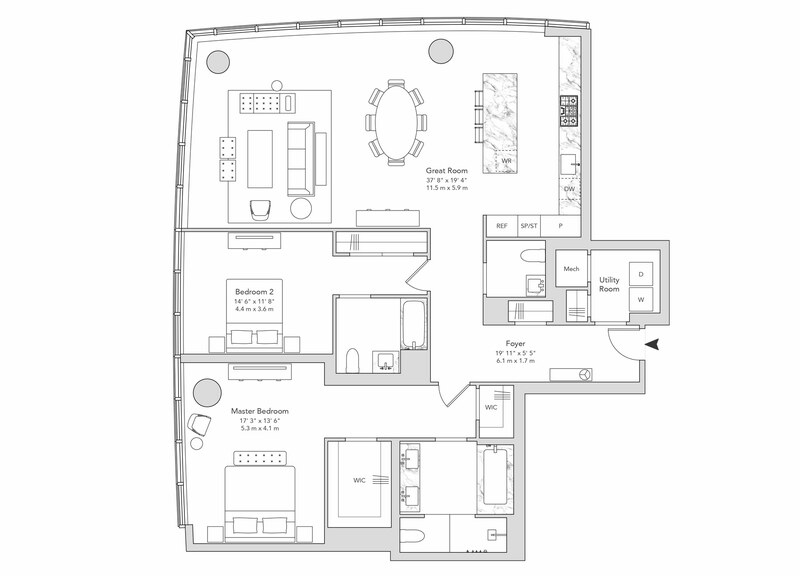 Loft Residence 64D is a spectacular two bedroom residence of 2,017 square feet with ceilings up to 10'10" and sunset views of the Hudson River. The spacious corner great room measures over 730 square feet and features a windowed open kitchen with a unique free-standing marble island, oak wood cabinetry and Miele appliances. 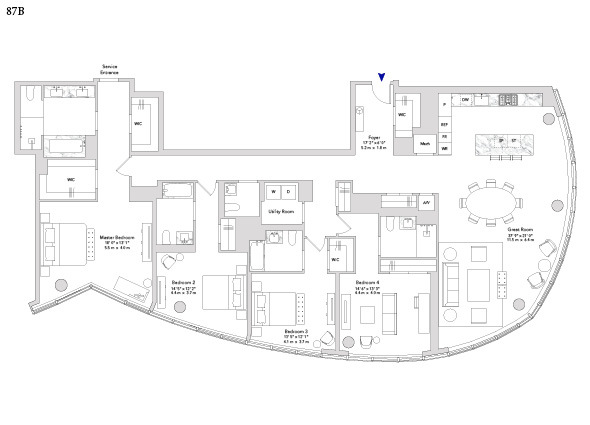 The master bedroom suite features two walk-in closets and a luxurious master bath. A second bedroom with en-suite bath, a gracious entry foyer, utility room with side-by-side washer dryer, and a powder room for guests make this a truly special home. Plaza Residence 30A is a two bedroom residence of 1782 square feet with views of the Public Square and Gardens, and Manhattan skyline. The corner great room features an open kitchen with a unique free-standing marble island, custom oak wood cabinetry and Miele appliances. A master bedroom suite with generous closet space and a luxurious master bath, second bedroom with en-suite bath, gracious entry foyer, and powder room for guests make this a truly stunning home. 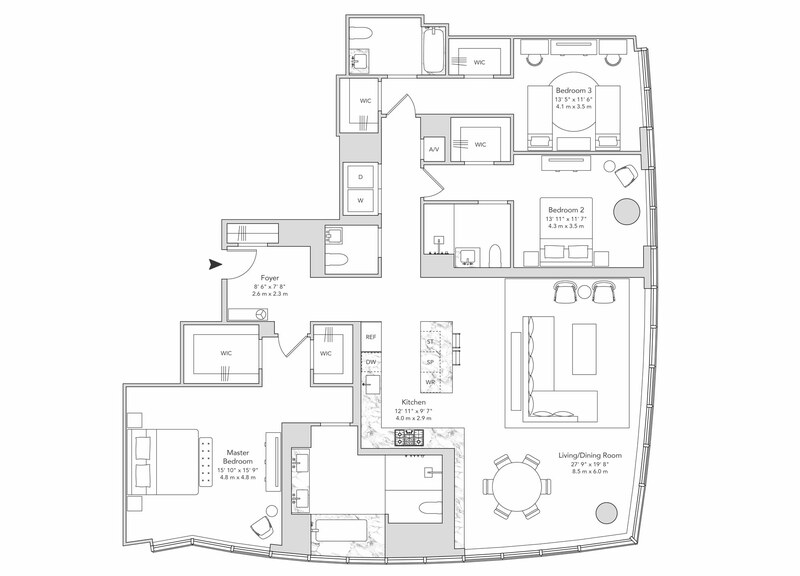 Plaza Residence 30G is a gracious two bedroom residence of 1464 square feet with ceilings up to 9'10", and views of the Hudson River and Public Square and Gardens. The great room features an open kitchen with a unique free-standing island, oak wood cabinetry and Miele appliances including wine storage. The corner master bedroom suite offers generous closet space, a luxurious master bath and sunset views. A second bedroom with en-suite bath, elegant entry foyer, and a powder room for guests make this a truly exceptional home.